Chef Boy caps the culinary adventure with Crepe Suzette in Orange Butter Sauce. This dessert is to die for. And it brings you right up to gastronomic heaven too! 1. Mix all ingredients into mixing bowl, then strain. 2. Have ready Teflon pan then pour ¼ cup of mixture pancake butter until golden brown and set aside. 3. Have ready orange butter sauce in flambé pan, then soak for 1 minute then fold into triangle. 4. Place on plate and top with one scoop of vanilla ice cream. 5. For Orange Butter Sauce; melt sugar until caramelized, then add butter, orange juice and Cointreau. Flambé with brandy. Stir from time to time until creamy. 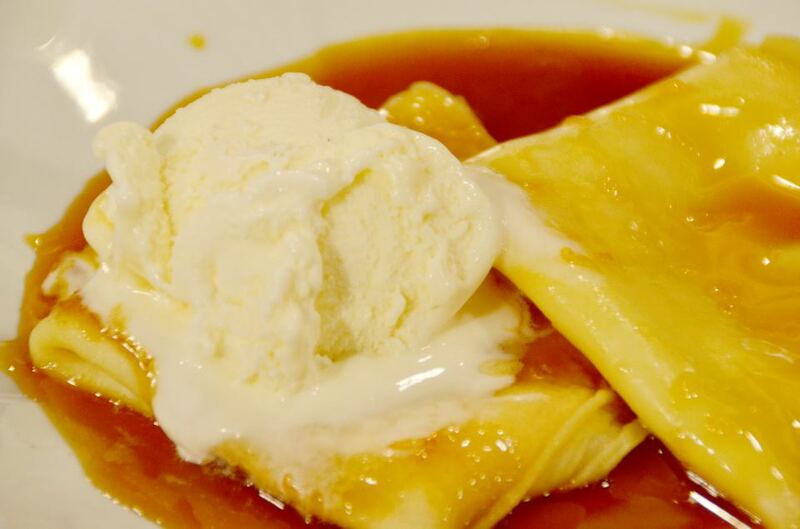 Hi Jane - Thanks for recommending cookware with Teflon® nonstick coatings while making your Crepe Suzette recipe! I represent DuPont and it's always a pleasure to see people recommending our products in their recipes.